Cardio is one key to achieving a flat stomach. Unless you were blessed with the flat-stomach gene, you’re going to need some huffing, puffing and sweating to get a flat stomach. Cardio workouts raise your heart rate and push your metabolism into its fat-burn zone. How much cardio you need will depend on how much weight you need to lose, how many calories you eat and how hard you want to work out. Before you start trying to flatten your stomach with cardio, you should understand that you cannot spot reduce. To take fat off your stomach, you need to burn it off your entire body. You have to burn more calories than you consume during the day, so diet is important, too. 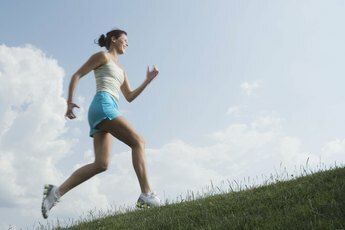 Exercising allows you to eat more, but you have to have a calorie deficit at the end of each day. Some abdominal exercise and strength training to target your core will help shape and tone your abs. To determine how much cardio you need to trim your stomach, you have to find your fat-burning heart rate zone, which is 65 to 85 percent of your maximum heart rate. According to recent research at Northwestern Medicine in Chicago, the most accurate way for a woman to find her maximum heart rate is to subtract 88 percent of her age from 206. For example, 88 percent of a 30-year-old woman’s age is 26.4. You then subtract 26.4 from 206 and get 179.6, her maximum heart rate. The woman’s fat burning zone is between 117 and 153 beats per minute. You have some choices for how long you work out in your fat-burning zone. If you choose long, slow cardio such as walking and jogging, you will stay at the low end of the zone for 45 minutes to an hour. Tempo workouts are shorter, but more intense, like running for 30 minutes with your heart rate close to the upper end of the zone. High-intensity interval training pushes your heart rate up or over its threshold for a short burst, then recovers at a low level. For example, you could sprint at your maximum effort for 45 seconds, then recover for 20 seconds, and continue that pattern for at least 20 minutes. The Centers for Disease Control and Prevention (CDC) recommends that adults get 30 to 50 minutes of moderate aerobic exercise five days a week. If you're working out at a higher intensity, then you need 15 to 30 minutes of cardio five days a week. However, the CDC suggests the more time you put into your routine, the greater the benefits you will see. So, to get your flat stomach, expect to work out aerobically five days a week for 20 minutes to an hour each time. The stomach-flattening cardio you choose is up to you. If you prefer exercising outdoors, walking, jogging, running and cycling all burn fat if you get your heart rate high enough. Indoors, treadmills, exercise bikes, elliptical machines and stair climbers are popular cardio choices. You can also investigate cardio classes at a gym or purchase workout DVDs like Zumba, kickboxing, or spinning. Whatever exercise you choose, be sure to stay in your target heart rate zone to make the workout effective. How Much Cardio to Lose 30 Pounds? What Kind of Exercise Burns Fats Stored by the Stomach?